Cutler Harbor. Photo courtesy of Billy Kitchen. 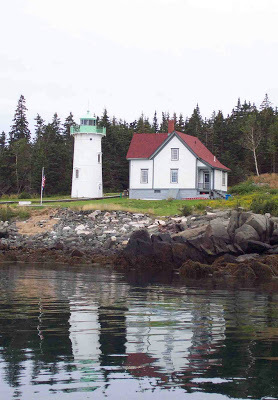 If you are interested in experiencing the authentic Maine coast and don’t want a “tourist” experience then Cutler Maine is an ideal spot for you. 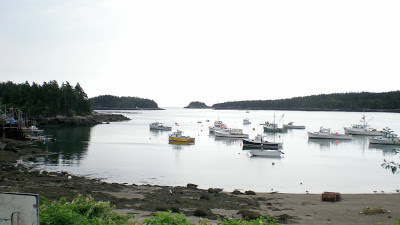 I admit I’m a bit biased as I was born and raised in Cutler, but it really does have one of the most beautiful, untouched-by-tourism lobster-fishing harbors on the coast of Maine. As described in my book:“The harbor is fed from one end by a little river… and protected at the other by a small island, upon which sits a working lighthouse. A smattering of boats rest in the harbor, and the surrounding land plays host to approximately one hundred modest houses. But what Cutler lacks in coffee shops and tourist trinkets, it more than makes up for in authentic charm and natural beauty. Both the eastern and western headlands that frame the entrance to Cutler Harbor are protected conservation areas containing beautiful hiking trails maintained by the Maine Coast Heritage Trust. 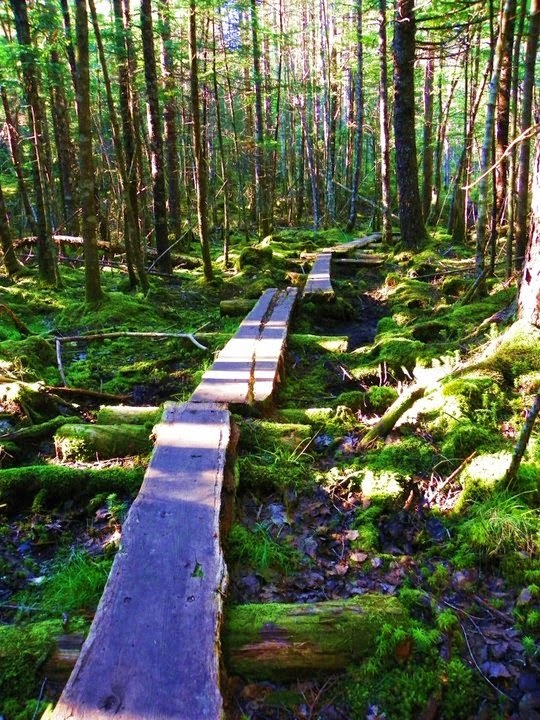 The Western Head Trail is a 3.5 mile ramble through spruce and fir forest, across rocky beaches and over patches of moss and wild cranberries. It’s one of my favorite hikes along the Maine coast due to its diversity and beauty. The Eastern Head trail is a bit shorter and leads to a lovely stone beach and views of the Atlantic Ocean. The beautiful start of Cutler’s Western Head Trail. If you’re looking for a more challenging hike, Cutler’s Bold Coast Trail will get your thighs burning and your heart racing. 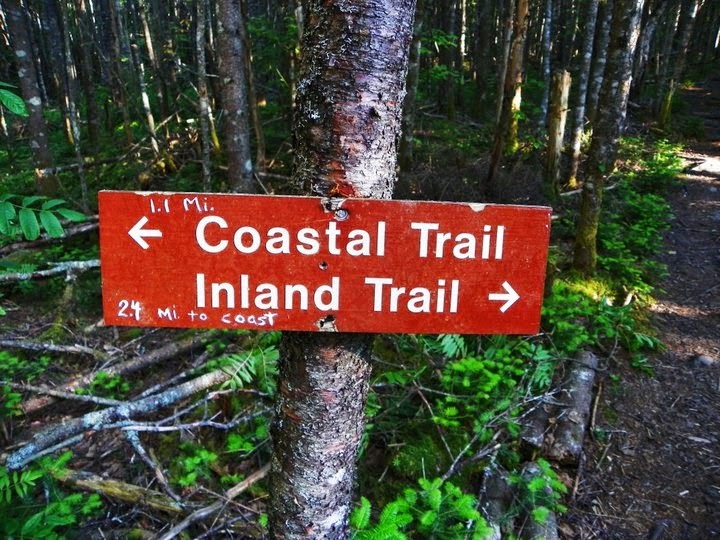 The full trail loop covers almost ten miles, with three and a half of those miles following the steep, rugged coastline. Some of the ledges are 150-feet high, making for breathtaking views (but be warned, there are no fences or safety barriers). If you enjoy camping in the rough, the trail offers three primitive campsites, available on a first-come, first-served basis. You can also complete a shorter, five and a half mile version of the trail. Cutler’s Bold Coast Trail. Photo courtesy of Jayson Maker. Beyond stunning hiking trails, Cutler also hosts an iconic working lighthouse which sits on a small island at the head of the harbor. During the summer months, you can arrange to spend the night at Little River Light which is a special experience. If you just want to view the lighthouse, Cutler local Captain Andy Patterson offers coastal sightseeing trips through his Bold Coast Charter Company. Along with the lighthouse and rockbound coastline, you’ll have the opportunity to see seals, eagles and possibly a whale while out on the water. Even more popular than the coastal tour however is Andy’s half day excursion to Machias Seal Island, summer home to the largest nesting colony of Atlantic Puffins along the coast of Maine. Bird lovers book up months in advance for a chance to observe and photograph these puffins up close, along with Razorbills, Common Murres and Arctic Terns. All of Andy’s tours leave right from Cutler Harbor. Cutler Harbor and sand beach. Just a two minute walk from The Cates House. While Cutler currently has no B and Bs, there are plenty of homes and cottages to let during the summer months. I recommend The Cates House, a charming, recently refurbished home just a two minute walk from the fishing docks and town sand beach. It has views of Cutler Harbor from pretty much every room, a sunny, wrap around porch and lots of history. The previous owner of the house, Jasper Cates, was one of the most prominent lobster fisherman in the village of Cutler. The current owners of the house, my brother, his wife and their kids, are also a family of lobster fishermen. They are lovely, salt-of-the-earth people (admittedly I’m a bit biased) who can give you insight into what life is like in a small lobster-fishing community, bring you fresh lobster during your stay or even take you out on the boat to see how lobsters are caught. If you visit Cutler during the Fourth of July, you will be able to witness a unique and wonderful hometown celebration which has taken place every summer since at least the late 1800s. The pomp and circumstance usually plays out over several days and includes a slew of unique games and competitions that you’d only find in Down East Maine. In addition to the typical parade and flag raising, there are coca-cola drinking contests, saltine cracker eating contests (the first one to eat a giant stack of dry saltine crackers then whistle, wins) and tug-of-wars between locals and people ‘from away.’ There is a challenging 5k road race in the morning and runners can refuel at the Methodist Church BBQ during lunch-time. 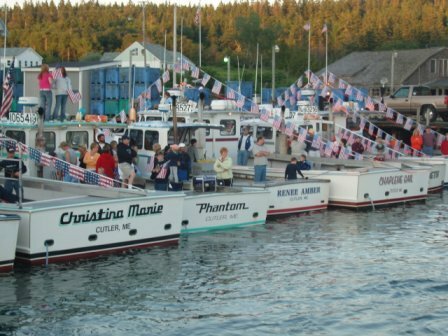 Cutler fishermen often dress up their boats with patriotic decorations and an informal lobster boat race is held in the afternoon. Sometimes there is even a Blessing of the Fleet. Cutler lobster fishing boats decorated for the Fourth of July. But perhaps the most unique event of the Cutler Fourth of July celebrations is the lobster crate race, where a bunch of barely buoyant, wooden lobster crates are precariously strung together and tethered between two wharves. Spectators are then challenged to run across the crates without falling into the icy water. Given the odds of making it across the crates are less than 10 percent and the water temperature is around 54 degrees, you’d think people would be reluctant to sign up for the challenge. Yet the opposite is true. In Cutler, we actually have to cap the number of contestants at fifty each year. For a look at the most recent schedule of events for the Cutler Fourth of July, click here. The Cutler Lobster Crate Races (photo courtesy of Billy Kitchen). 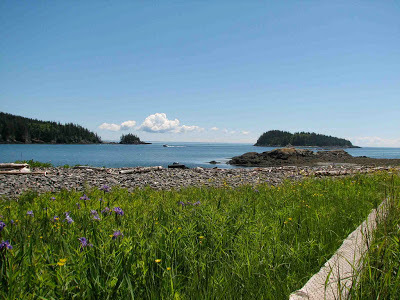 Finally, Cutler is a great base for day excursions, including trips to other coastal villages like the towns of Lubec (a 30 minute drive) and Eastport (an hour drive or a pretty ferry ride from Lubec) and the Canadian island of Campobello, with it’s stunning, mile-long Herring Cove beach. 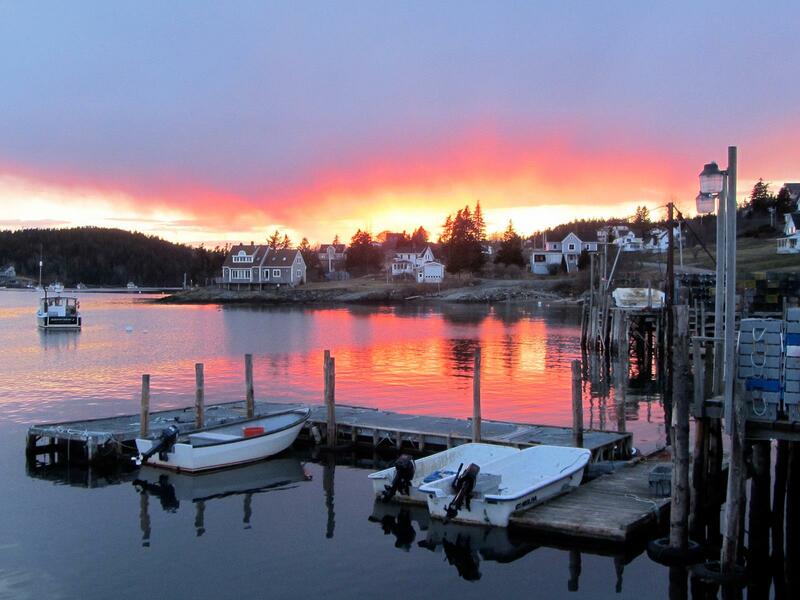 To return to my list of the five prettiest lobster fishing villages in Maine, click here.